Click here for audio of Episode 508. Today, we ride a Ferris wheel. The University of Houston's College of Engineering presents this series about the machines that make our civilization run, and the people whose ingenuity created them. There is an awkward moment at the top of a Ferris wheel when, having come up the inside curvature, where we are facing into a firm structure of confident girders, suddenly that structure disappears, and we are thrust out into the sky for the outward curve down. Jaynes uses the Ferris wheel as a metaphor for that instant of uncertainty when a new truth reveals itself to us. He knows that the moment of discovery -- or of understanding -- holds a thrill of life-and-death terror. So how did the Ferris wheel, and its strange metaphorical power, come into being? George Ferris, a young civil engineer, invented it. The new Eiffel Tower had been a nettle in Ferris's mind. The French seized our imagination with their crazy tower. Now, America had to answer. By 1892 Ferris knew what to do. The French had driven a spire upward. He would create a great Ezekiel's Wheel in the sky. The idea came to him in a Chicago chop house. He was dining with engineers working on the Chicago World's Fair. By supper's end, he'd sketched the whole thing. It was a 250-foot wheel with 36 passenger boxes. It would turn on a 45 foot axle. He would levitate 42 tons of steel into the air and spin it around. Ferris wouldn't use rigid spokes. Instead, he'd make a web of taut cables -- like a bicycle wheel. Of course, the other engineers didn't like it. It would fall over in the wind. It'd never carry its own weight. But Ferris prevailed. He built the wheel for the Chicago Fair, and it ran like a Swiss watch. When a hurricane swept the fairground, the wheel stood fast. Ferris died just four years later. He was only 38. He didn't live to see the spawn of his machine -- the first roller coaster -- the soul-testing, gut-wrenching, machinery of today's amusement parks. Before he died, someone asked if he had other projects in mind. "I'd better not say," he said, "some of them might be too frightening." Ferris, it seems, finally saw that his great wheel did something much more than compete with the French. It really did thrust the rider "out into the sky, for the outward curve down." So it is with good ideas. They rise suddenly out of the blue. They carry things we don't expect. No one thinks about Ferris wheels competing with the French today. 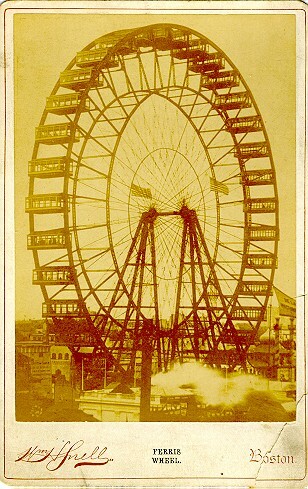 Instead, that huge wheel and all that followed it speak to us of thrill and motion -- and the very nature of new ideas. Hambleton, R., Ferris. The Branding of America . Dublin, NH: Yankee Books, 19? ?, pp. 101-103. Jaynes, J., The Origin of Consciousness in the Breakdown of the Bicameral Mind . Boston: Houghton Mifflin Co., 1976, Chapter 3, p. 67. Note added in April, 2010: Since this episode aired in 1991, much more attention has been paid to Ferris and his work. We recommend this excellent site for more on the man, the wheel, and a new ASCE book by Richard Weingardt: Circles in the Sky.